The goal of most investors is to some day build enough wealth in order to stop working and do what they enjoy. The problem is that doing so takes a large amount of wealth built over time, something that may seem far-fetched to a young investor. However, by investing in dividend stocks diligently over time and reinvesting the dividend payments, investors can indeed become rich with dividends. Becoming “rich” means different things to different people but in essence, it is the ability to stop working because one has to for money’s sake. This goal is attainable for just about anyone with a suitably long time horizon and the discipline to make it happen. There are a few key variables an investor has control over when it comes to becoming rich from dividend investing. First, the investor needs to commit to saving at regular intervals and in sufficiently large amounts. The average savings rate in the United States has been about 7% in the recent past, although this rate fluctuates significantly over time. Saving as much income as reasonably possible is a big step towards building long-term wealth. Next, one has to develop a systematic plan for long-term wealth building. Over time, the stock market has produced roughly 9% returns on a compound annual basis, so time is on the side of investors with a longer period to work with. It is important to stay disciplined through ups and downs, and part of that is sticking to one’s plan. One way to do this is to invest in stocks with dividend reinvestment plans, or DRIP, in order to make reinvesting automatic. Over time, the combination of an ample savings rate, reinvestment of proceeds and returns from stocks themselves can make just about anyone rich (over the long run) from investing in dividend stocks. Our investor is contributing $4,200 annually as we make the conservative assumption that the investor isn’t able to increase contributions over time. Ideally, investors can contribute more as their income grows, making it more likely to become rich with dividends. Our investor has a thirty-year time horizon as they want to retire at age 65 but start at age 35 with nothing saved. Since compounding is such a powerful tool, investors want to start as early as possible. However, that doesn’t work out for some people and it is important to know that starting late is superior to never starting at all. Over this example spanning thirty years, our investor contributes a total of $130,200, which is simply the annual contribution of $4,200 times thirty years. However, with the power of reinvestment and compound annual returns, the ending balance in this example is more than $628,000, or nearly five times the contributions the investor made. That is the power of compounding at work and that is why it is important to start investing as soon as one is able. In addition, selecting high-quality dividend stocks gives investors the best chance to achieve strong returns over time, including reinvestment of dividend payments. In our example, the investor ends with a balance of $628k and if they are able to continue investing in dividend stocks with an average 3% yield, they’d see nearly $19k in annual dividend income without ever having to withdraw principal from their account. If the investor is able to increase their contributions annually by 3%, the ending balance goes up to $837k from $628k, an increase of about one-third. This would also boost annual dividend income to $25k on a 3% average portfolio yield from $19k in our original example. Obviously, the earlier one can start, the better, as investors with longer time horizons are better able to capture the power of annual compound returns. In addition, contributing more obviously helps as it amplifies annual returns and eventually, the amount of income one can produce from their portfolio. To show the power of starting earlier, this example has exactly the same starting balance, contribution rate and rate of return, but the investor starts five years earlier at age 30. The difference in adding another five years to the investor’s time horizon is striking; the ending balance is just under a million dollars versus our previous example of $628k. 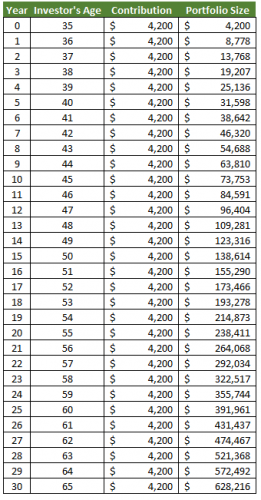 Nothing else changed other than the time horizon and an additional $21k in contributions, but the investor ends at retirement with $363k more in their account than they would have by starting at age 35. The power of compounding is immense, and this is how it is possible for even a relatively modest savings rate to produce strong income for retirees if they can make a plan and stick to it. In real life investing, there are more variables that can impact how much wealth an investor has at retirement. For example, returns do not simply accrue at 9% annually; some years see much more, and some see much less. Taxes and fees can also play a part in what an investor gets to keep, depending on how the individual invests their money. However, by creating a plan to invest in dividend stocks over time and sticking to it, investors of relatively modest means can save hundreds of thousands of dollars – or more – by the time they retire. This not only provides a measure of financial security but also the ability to generate passive income from the portfolio. Getting rich with dividends may seem like an unrealistic goal for investors that are just starting out, but by using the power of compounding to one’s advantage, just about anyone can indeed build both passive income and wealth through dividend investing.